Luke is a New Orleans based harpist and bagpiper with 26 years of experience. He has played at such venues as St. Louis Cathedral, Preservation Hall, Voodoo Fest, Spotted Cat Music Club, Irish House, French Quarter Fest, the Marigny Opera House, and many more. He has also done orchestral work, composed, arranged and accompanied theater and dance productions. He has played with many New Orleans bands including the Herringbone Orcestra, Helen Gillet’s Wazozo, Aurora Nealand’s Royal Roses, the New Orleans Celtic Harp Ensemble, the Pipes and Drums of New Orleans, and many others. 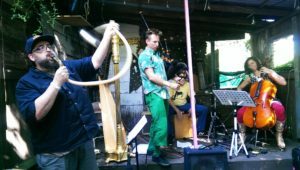 Luke plays the full pedal concert harp and smaller Irish lever harp. He specializes in Brazilian choro on the pedal concert harp, a joyful, chromatic cousin of traditional New Orleans jazz. 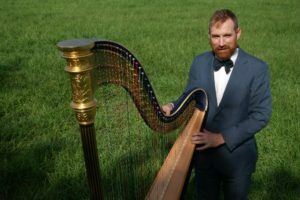 Luke is also a traditional Irish harp champion, representing the Eastern US, and composes and plays a bit of Jazz, Pop, Classical, Eastern European, and new and old New Orleans music. Luke took up harp at 11 years old in his home of Sioux Falls, South Dakota. 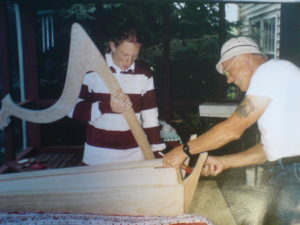 He built his first harp at age 14 with his grandpa, and still uses it today along with three others. In high school he also took up bagpipes and ukulele, building his own electric ukulele before traveling for a year in Brazil. 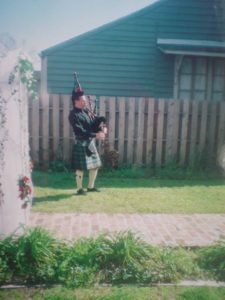 He continued bagpiping at Beloit College, going on exchange to Scotland to study Gaelic language and Scottish music and playing at traditional music sessions. He studied for a semester at Fudan University, Shanghai, where he played harp in a magical teahouse and on the radio. After co llege he worked with the Big Apple Circus, busked playing harp for a year in Seattle’s Pike Place Market and saving up to attended The Clown Conservatory in San Francisco. He toured the country for two seasons with Ringling Brothers and Barnum & Bailey Circus, playing bagpipes and serving as band-leader in the clown marching band. In 2007 he moved to New Orleans, on the encouragement of cellist Helen Gillet. 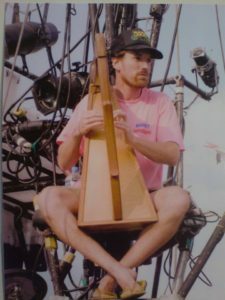 He toured Greece with the Caravan Stage Company the following year, performing rock opera ballads on the deck of sailing barge. In 2008, he returned to New Orleans and rebuilt a vine covered abandoned house into a home, rebuilt a sailboat damaged in hurricane Katrina, and rebuilt an antique electric car. With Gillet, he played in the trad itional French band, Wazozo as well as the Herringbone Orchestra, led by Lady Sea Monster. He won the 2009 Comhaltas traditional Irish harp competition for the eastern US, and competed in the All-Ireland. He walked from Dublin to Tullamore with his harp on his back and was a crowd favorite. He has taught harp at the New Orleans Jazz and Pop Harp Weekend, Lark Camp in Mendocino, CA, and performed in Monaco. 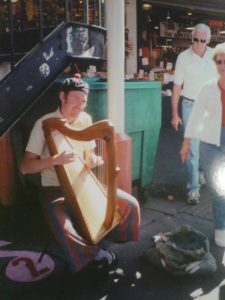 In New Orleans he’s played harp at churches such as St. Louis Cathedral, Trinity, St. Francis Xavier, St. Anna’s Episcopal, and Our Lady of Perpetual Help and the French Quarter Wedding Chapel. 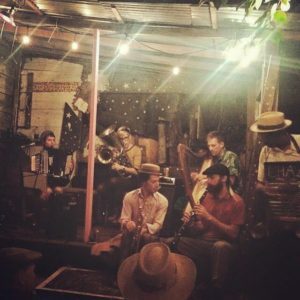 He’s played gigs at Preservation Hall, Spotted Cat, Irish House, Circle Bar, Siberia, Allways, HiHo Lounge, Mimi’s in the Marigny and the Marigny Opera House, and festivals such as Voodoo Fest, French Quarter Fest, and Chaz Fest. The black and red Pilgrim Progress was made in England in the 1990’s. This harp was formerly owned by pop harpist Deborah Henson-Conant, who added the sparkly soundboard. This is the harp that Luke plays most. The gold harp is a Lyon & Healy style 18 built in Chicago in 1909 and restored in 2010 by Howard Bryan in Lynchburg, Virginia. The third is a Gothic, styled after the harps from the 1500’s. Built by Luke and his grandpa Frank from a kit from Musicmakers in Minnesota. The smallest is also a musicmakers, styled after the traditional harps of Ireland.